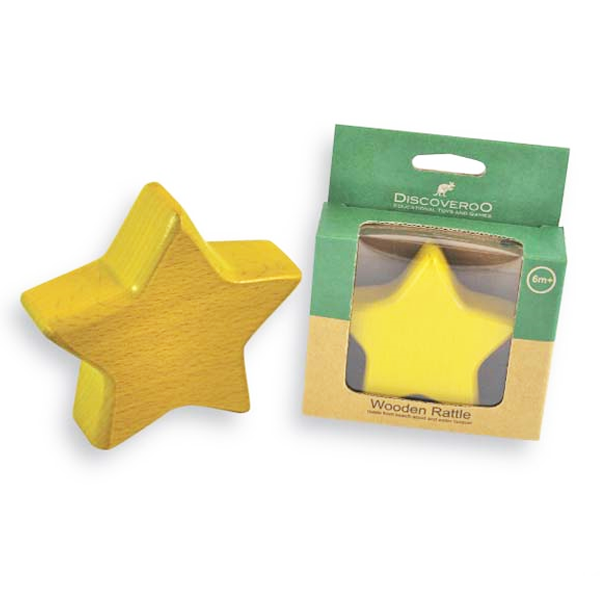 Designed for little ones to shake, chew and bite, this wonderfully simple star shaped wooden rattle is the perfect size for little one's busy hands. 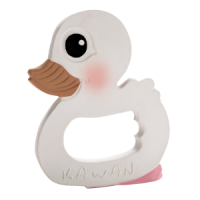 All they need is a shake to reward little one with a very satisfying rattle sound! Made from sustainable Plantation Beech Wood and painted with a safe water lacquer. Comes in an attractive gift box and makes a perfect gift for your friends and family and yourself! Suitable for 6+ months. Approximately 8cm high. Made from ultra smooth 100% plantation beech wood. Natural materials stimulate a child's mind in a way that plastic never can. Small enough for little hands to hold and shake, the Discoveroo Star shaped rattle is a great little plaything to while away the time with. Discoveroo toys have high quality wooden design structures so they are solidly built and have been tested under heavy stress conditions to guarantee workmanship and materials. 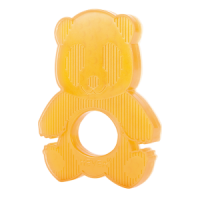 Every Discoveroo toy intends to open out the possibilities of extended creative play. Made from Plantation Beech wood that has been ethically sourced. Painted with a safe water lacquer. Such a sweet and wholesome little rattle. No garish colours or plastic, just nice and natural. Bought one for a friend too, and their little boy really likes it.